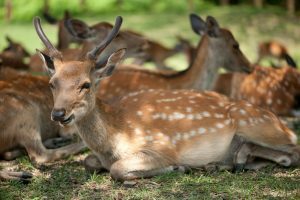 Nara is ideal for those who wish to see not only numerous historical structures but also to touch, feed wild deers roaming freely around in the Nara Park. There are 8 UNESCO heritages in Nara spotted sparsely in the historic regions which have full of rich tales in Nara period (from 710 to 794). Visiting 4 UNESCO heritages (3 temples and 1 shrine) in this tour in addition to one Japanese garden. Messenger of deity of Kasuga Great shrine, 1,200 deers welcome you all the tour long in Nara national park. First stop is Kofuku-ji temple which was founded by Emperor Shomu in 726 during Nara period where the five-storied pagoda is a symbol of Nara national park viewed over Sarusawa Pond. Next is a short walk to a Japanese garden, called Isui-en (on the way to the Todai-ji temple) is also a must-to-see scenic spot. The third stop is the main attraction in Nara i.e Todai-ji temple, the largest wooden structure in the world, built in 752 and 2.8 million people took part in to construct, houses the 15 m tall Great Buddha statue. Fourth stop is Nigatsudo Hall which stands close to Todai-ji temple where the water-drawing ritual ceremony is being held in every March since 752. Last stop is Kasuga Great shrine which is a national shrine founded to protect the Heijyo-kyo, the new capital of Nara (form 710 to 794). 2,000 stone lanterns and 1,000 hanging lanterns are lit in February and August and it brings you date back the time of the ancients.